For 2016 Sterling has reintroduced its Elite range of luxury high-end tourers, as we reported in our Swift Group news story. The Sterling Elite caravans were dropped a few years ago, to the disappointment of fans. 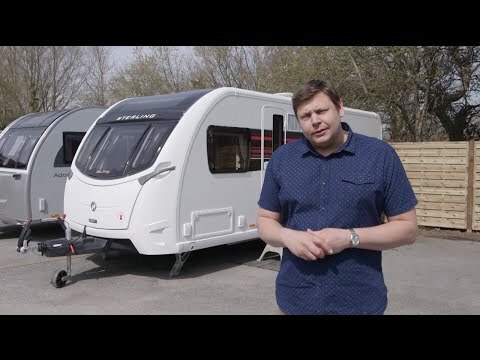 So we welcome Swift's decision not only to bring the range back, but to build it using the Swift Group's latest SMART HT construction, as first seen on the Swift Elegance and Sterling Continental ranges. A good specification is part of the Elite range's appeal, and when you see the Sterling Elite's superb new profile, too, it looks like the real deal. The Elite 560 has a new layout and offers a front lounge, side kitchen with fridge-freezer opposite. The washroom is then placed between the kitchen and rear bedroom, with the loo on the left and shower cubicle on the right and hand basin placed centrally. At the rear, the fixed bed is placed as an island layout with wardrobes on either side. This layout was brought into play by Coachman last season and became a surprising success. It was inevitable that other makers would soon come up with their own versions of this idea. Swift has taken up the challenge and offers this layout in the new single-axle Sterling Elite 560. So, how well does it work? And to see other Sterling caravans for sale, click here. The latest 2016 Elite range does not skimp on its specification and also has some sporty looks to go with it. The range has a matt-finish black A-frame and bold side decals, while well finished GRP-moulded front and rear panels add to the Elite range's appeal. Built on an Al-Ko chassis, the Elite comes with heavy-duty steadies, AKS hitch and ATC. Barbecue and exterior mains sockets are also fitted. The Sterling Elite caravans now have hail-resistant GRP sides and roof, which gives the range a tough, durable shell. LED road lights have also been added for 2016, while there is excellent access to the gas locker, where there is room to store other items as well. The profile is similar to the luxury up-market Sterling Continental range, which is no bad thing. The Sterling Elite 560's service points are placed on the offside, though there is a wet locker on the entrance door side. Mounted on the roof, the Elite also has an 80-Watt solar panel and the latest Status digital TV aerial. A spare wheel comes with the Elite as standard, and we found we could set up the Elite quickly, thanks to easy access to the corner steadies. There's an LED awning light placed directly over the one-piece entrance door. The rear panel has fixing bars for an optional Thule rear-mounted bike rack for two bicycles. Overall, the exterior profile of the Elite looks good and is all part of the continual evolution of tourer design within the Swift Group. The Elite's interior is as contemporary as you can get, and with this design flair in evidence it is a tourer for those who like to stand out from the crowd. The 560’s lounge area is roomy enough for four to use. The dinette offers a central chest of drawers, complete with a pull-out occasional table, ideal for snacks and drinks. The lounge enjoys natural light from a large sunroof, with the Elite name displayed centrally below it. Two bolster and scatter cushions are supplied, while below the seat bases the Elite has large access flaps. As you would expect quality loose-fit carpets are part of the specification. There's also an extra rug, in keeping with the Elite's contemporary interior. An alarm sensor is fitted below the chest of drawers, while on either side of the lounge there are useful overhead roof lockers. The front shelf has the usual Swift moulded unit with two plug sockets fitted. Overhead there is dimmable LED lighting, boosted by four corner LED spot lights this is also supplemented by ceiling lights just above the sunroof where the radio/CD speakers are placed. One thing's for sure, the lounge allows plenty of leg room and provides enough space for a couple to sit back and relax. The designers have had to make some sacrifices in the Elite 560, yet still come up with a perfectly practical kitchen area. The overall design looks strikingly modern, with its charcoal finish, and the FENIX NTM® kitchen worktop is hygienic, scratch-resistant, easy-to-clean and has an extending flap. The kitchen has two cupboards and a drawer with a new easy-glide operation. As for appliances, there is a 134-litre Dometic fridge / freezer placed opposite the entrance in the Elite. There's a stainless-steel sink, with a clip on drainer. A centrally mounted microwave oven boosts the latest Aspire Mark 2 oven, with dual-fuel hob. For clearing cooking smells an Omnivent extractor fan is fitted just above the cooker itself. The kitchen is practical, but even with the worktop extension some may find they could have done with extra worktop space. The kitchen also has a twin-socket, so that you can plug in your kettle and devices. When it gets dark, you'll find a useful LED light under the overhead locker as well as three LED down-lighters overhead. For Sterling's designers, trying to configure this layout on a shorter body length must have been a real challenge. Despite this, the Elite's centrally placed washroom hasn’t been too compromised and offers good floor space. Walk into it from the lounge and you have the shower cubicle on your right and the cassette loo on the offside. The hand-basin is placed between the two entry doors to the rear bedroom. A solid door keeps this section of the Elite private and once it's shut off it’s a sizeable washroom area. The shower cubicle is a moulded unit and comes with the latest Ecocamel Orbit water-saving shower-head (with on/off water-saving switch), while the toilet is Thetford's swivel electric flush model. Behind the loo is an opaque window, with an overhead cupboard with shelves. The hand-basin is quite deep in design and above it is a large mirror. We were impressed with the amount of general floor area and natural lighting levels in this Elite washroom. The lounge area is pretty spacious, so you'd expect the made-up bed to be a pretty good size, and it is. The sofas turn into a proper double bed, measuring 198cm x 163cm. With Swift's own AirWave seating, the claim is that the sofas offer the right amount of support and cushioning for use as a bed as well. It's relatively easy to make up, using the slats, but the cushions on the offside on our prototype did catch the fold-down kitchen worktop flap when we were making up the bed. Unfortunately the sofas are just too small for most people to use as single beds. The largest settee is 163cm (5ft 4ins) long, which is okay for small children. Now for the main attraction. Let's face it, the Elite 560 is a model designed mainly for couples, and most will choose to sleep in that fixed island double bed at the rear. Fitted with a Duvalay Duvalite mattress, the fixed bed's comfort is assured. During the daytime the floor space is unrestricted, then at night you can add extra length to the bed, by pulling the bed base forwards by a few extra inches. This extra length means a separate section of mattress slips into place. The result is that the rear fixed bed measures 182cm x 133cm. This is smaller than the made-up bed in the lounge. Still, it's a good fixed bed for a single-axle caravan layout and we can see that the designers have used every centimetre of space efficiently. The Elite comes with some great storage capacity, notably in the rear bedroom. Wardrobes are placed either side of the double bed and there are also ample overhead lockers. Beneath the wardrobes the designers have added a cupboard. There's more storage in the washroom, where there is a good-sized cupboard beneath the hand basin as well as two overhead lockers. Storage in the kitchen is a little more restricted, with just two overhead lockers, two cupboards and a drawer. The front lounge has side overhead lockers and the central chest of drawers, plus a small cupboard below. It all adds up, and the Elite 560 offers a couple enough storage for longer trips. The Sterling Elite 560 is quite well equipped. It boasts Alde heating. It's a high-tech tourer and uses Swift's new control panel, which can be also operated with the newly developed Swift Command system, using your mobile, tablet or computer. The contemporary interior is fresh and overall storage is good. This layout works well and Swift has packed a lot into the Elite 560's 5.83 m length to make this layout work. It is quite an expensive caravan, but then you're getting the latest in tourer construction. For those wanting an up-to-the-minute design, the Sterling Elite 560 will prove an attractive buy.